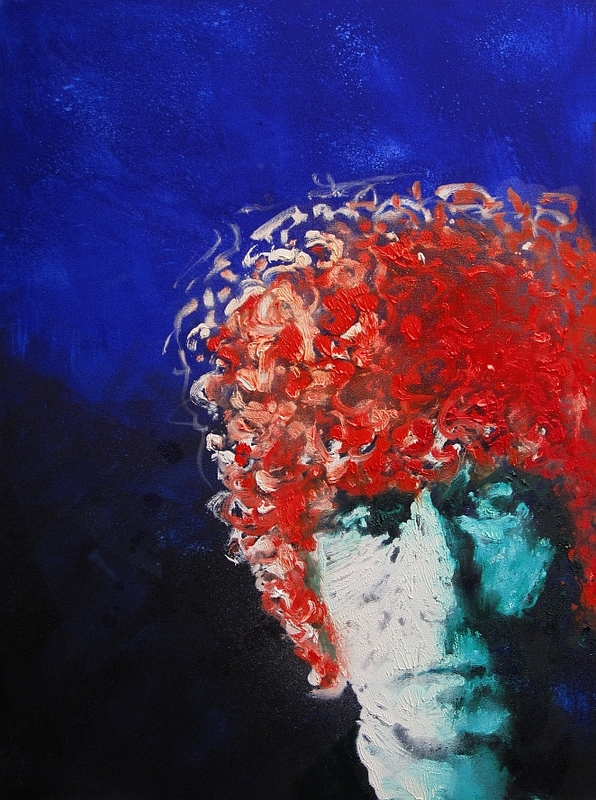 Brett Whiteley loved Windsor & Newton Ultramarine. In some of his most iconic paintings one drowns in a Sydney Harbours of blue, looking for splashes of white - a yacht, a bird, a palm - on which to cling so that, Alice-like, we aren't sucked down into some surreal world. I finally feel ready to move onto oils after my charcoals and inks in search of a vision of Brett . So this image is based on my Brett Whiteley in lino block prints [here]. It is actually a large monoprint with some subsequent adjustments by brush and solvents.. Some days earlier i made a series of 16 monoprints in oil on A3 paper. They are intended to be viewed as a single work. I haven't been able to photograph and blog the set because of the danger of smudging the paint when handing 16 pieces at a time. And so i am posting this painting first although it follows on from them. 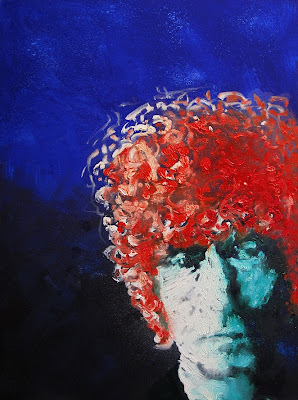 The bottom half of the background is actually Prussian Blue and i wanted the flame-haired Brett (following on from my Brett Whiteley sees red set below) to be be set against the darkness, both standing out against it and progressively being swallowed by it. Foremost in my mind was the tale of the passionate Aussie larrikin artist reduced to isolation and depression. I crowded the head into bottom right corner, seeking a sense of 'being squeezed out the picture', of 'everything crowding in', of 'struggling to remain in the frame' of fame. It is so hard to keep your flame burning when you are no longer flavour of the month. But this work is not chiefly about composition. 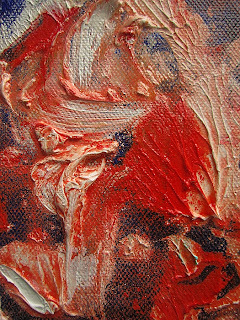 It is very much about painterly mark-making and texture. 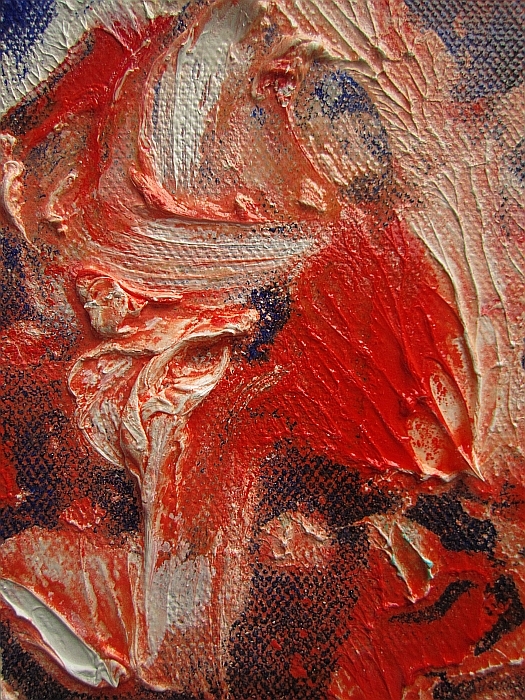 In many ways, it is more a figurative abstract than a portrait. The the fresh primary colors and knobbly lavish paint-work is what first strikes the viewer when presented with the actual work rather than a photo. This effect is heightened by the size of the work. While not huge, nevertheless a height of over a metre gives it a decided presence. Exploratory work, Laura, but thanks, youre very kind. Thanks so much for your interest, Celeste. I doubt very much there will ever be an exhibition of this work, not even for my examination. For the time being many of these images come up when one google-images 'BW drawings' or similar, and i will need to content myself with seing my work among his in the public domain for a season, but i think they are destined to simply sink into oblivion over the coming year. You question about the self-destructiveness in some artists puzzles me too. I am esspecially interested in the relationship between their personality and their work. Could one know Brett simply from looking at his work? Can we explain his work simply by knowing something of Brett? The two are obviously connected but not in an obvious way. Thanks again for your encouragement, Celeste. I don't think this Whiteley series is to a lot of people's interest or taste, so your support is especially valuable to me. Amazing work, Harry--this painting and the "Brett Whitely sees Red" series. I'm with Celeste; I'd be in line for the exhibit. A redhead? From experience, I'd say that's a tough way to start life. Haha, yes, he was a redhead, Hallie. I doubt there will ever be an exhibition but i am toying with the idea of collecting the best of Whiteley material together once i'm finished and, like Caio and Monica, putting out a Blurb book. They have done such brilliant jobs with theirs.